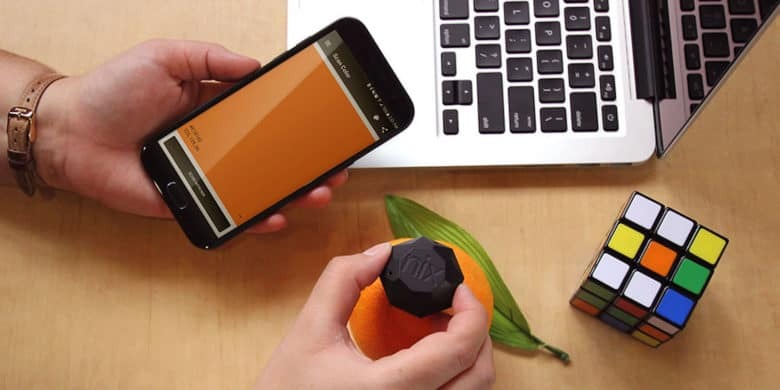 This sensor and app can tell you the exact color of almost anything. This keychain-sized sensor can tell you the precise color, for liquid and digital paint. Getting the color you see in the world to match the color on your brush can be tough. Whether you’re painting on canvas or designing on the computer, working with exactly matched colors takes a trained eye. And sometimes, it takes a handful of color swatches. Unless of course you’ve memorized the color hex code system (and let’s be honest: you haven’t). The Nix Mini gives your iPhone a precise eye for color. The pocket-sized sensor scans any colored surface, saving it straight to your phone or tablet. It matches the color it sees to a library of more than 28,000 brand name paint colors, or RGB, HEX, CMYK, and LAB formats. And right now, you can get a Nix Mini for just $69 at Cult of Mac Deals. Whether it’s painted walls, a vinyl couch, leather tools, plastic toys, clothes, you name it. Nix just looks and tells you the color in whatever format is most useful to you. When you go to the hardware store, they can mix paint to the exact color you spot. Same if you’re using it for graphic or web design purposes. The device itself is smaller than a ping pong ball, fitting comfortably on your keychain and connecting straight to an including iPhone or Android app. Integrated high CRI white LEDs provide a consistent light source for every scan, and a solid state technology means the Nix Mini is super durable. Buy now: Pick up a Nix Mini for $69, that’s a 30 percent discount.